Categories: "indigenous people / minorities"
Nearly every hour an anthropologist somewhere on this planet publishes a blog post in English. 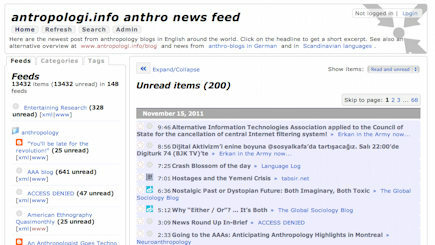 The antropologi.info overviews over the newest blog posts in English are now updated with several new blogs. I’ve also removed some blogs that haven’t been updated for a while and tried to fix some bugs. It’s not the edited overview with hand picked posts that Greg Downey at Neuroanthropology is looking for, though (and I hope will be realised somehow in the near future as well). 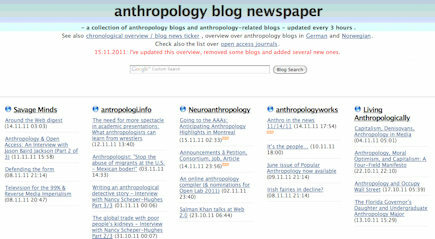 I haven’t included all anthropology blogs, though, so there was some editing. While Cairo’s slum areas are growing, the richest layer of the society is enjoying a luxury life in privately guarded communities in safe distance from the lower classes. 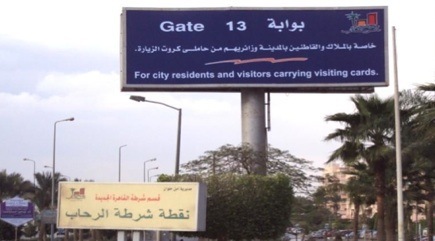 Hosni Mubarak’s neoliberal dream of segregation seems to have come true. But during the Egyptian revolution some of the young people have started to tear down the walls of their gated communities. Safaa Marafi from the American University in Cairo (AUC) tells us in her well-written anthropology thesis the story of the giant segregation projects of the Mubarak regime. She has conducted fieldwork in Al-Rehab, one of those gated communities constructed on desert land, where the middle- and upperclass isolate themselves, shop in luxury malls, use private door-to-door limousine services and send their children to private schools or universities. It’s a thesis about how neoliberal policies threaten the cohesion of a society. This segregation began when the Egyptian Ministry of Housing sold massive amounts of desert land, situated at the margins of Cairo, to private corporations. Approximately 320 private corporations purchased portions of this land and planned projects for a potential 600 thousand housing units (Denis 2006:52). This expansion process resulted in the construction of numerous gated communities in the suburbs of greater Cairo. The neoliberal dream of segregation can be defined as a political-economic agenda adopted by the Egyptian government, which fostered and supported rich local and foreign investors in building gated communities in Cairo‘s suburbs. By constructing these enclaves for the richest layer of Egyptian society, these development projects created a physical segregation in Cairo‘s urban fabric. This segregation is evidenced by the way the residents of these hinterlands are protected by private security systems, walls and/or fences, gates, and private security guards. “Neoliberal policies”, Marafi writes, “have encouraged class-based urban segregation, leading to polarization in the urban fabric.” The adoption of neoliberal polices turned the state into a private territory, where wealth is monopolized by political elites and businessmen. This segregation is not only related to space but also related to the mind. Living in this gated communities intensifies the mood of moral panic felt towards the other - people from lower classes. “This is”, the anthropologist explains, “because they believe that their community is labeled as a rich one and therefore may be a target of potential criminals. State and media contributed to the fear of the other. Not only the marketing campaigns of gated communities seek to convince potential buyers that outside of the gates, fences, and walls of these closed venues lies a dangerous world. The consequence is a “culture of fear”. Many residents, especially in recent times, moved to Rehab for class and safety reasons. They wanted to isolate themselves from the other. But soon they had to realise that they cannot live without “the uncivilized others”. They are dependent on them. For who shall clean their houses, deliver food, and patrol the streets to protect them? The supposed enemy and security threat is living among them! The residents feel a need to apply extra security measures. Despite these measures taken by the participants, the private security department of Al-Rehab, and the public police, the participants‘ fears are not alleviated, Marafi writes. Security cameras, intrusion alarms, extra secure locks, as well as guard-dogs, can all be observed in the community. In addition, there are some shops which sell extra-large security lamps to be attached onto the roofs of villas. In many villas, the use of such lamps as security tools makes the villas look more like military buildings at night, rather than family residences. In addition, surveillance real and fake cameras are among other security methods implemented by other participants. Fake cameras are sold in at least one of the most popular electronics shops in the souk of Al-Rehab. Some residents don’t even trust the security guards. Nora is one of them. Private security, she points out, relies on guards, and as they are humans they might fall asleep while on the job. Moreover, Nora claims that there are some cases where private security guards collaborated with criminals. Madam Sara drives every night and checks the kiosks of the security guards located around her villa. If she does not find a security guard in any of these kiosks, she takes a picture of the empty kiosk with her camera and sends the picture to the security department. The security department trusts her word over the security guards and punishes those guards who were not in their positions or patrol areas. Also, she reports to the security department if she finds any of the security guards falling asleep, and she also takes pictures of them as evidence. The anthropologist has noticed that classist phrases are used frequently. Being protected by private security guards and systems creates a sense of superiority. When for example Nora explains why she moved to Rehab, she stresses that she wanted her son to live in a “clean neighborhood” when he gets married. Mohandessin, where they lived previously, “became old-fashioned”, populated by lower classes and “polluted”. In Rehab, on the contrary, reside “clean people", their neighbors are “respectful” and “civilized people". The prejudicial connotations of these elitist, classist notions of newness, civilization, cleanness and decency indicate a desire for urban segregation and a keeping of distance from “the other”: the dirty, polluted, and uncivilized. Security measures are also used to show wealth and status (“conspicouos consumption”). Some of the residents design security bars using branded logos, such as Versace. Others paint their security bars in different colors, such as white, to differentiate themselves from others (“aesthetic security”). While slums are stigmatized by poverty, gated communities are labeled by their richness. It is not that one group should be victimized over the other, but they both ought to be understood as victims of the implementation of the neoliberal segregation policy. But her thesis has a somehow “happy ending” (depending on your world view of course), caused by the 25th January Revolution. In the beginning of this unexpected revolution, none of my participants showed interest in joining the peaceful protests. 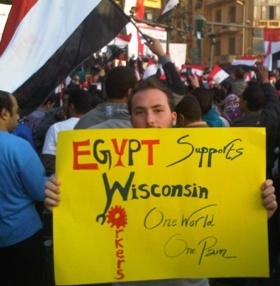 (…) Yet, as I learned, a few of Al-Rehab‘s youth are active agents in this revolution. The neoliberal segregation plays a role in detaching many, but not all, of the residents of Al-Rehab. The youth especially were the ones participating in the political sphere. (…) Optimistically, this tells us that some of the youth of Al-Rehab want to be part of the world outside their gated community. Safaa Marafi sent me a video from the youth celebration in Rehab after the announcement of the resignation of President Hosni Mubarak on 11th February 2011. “The quality is is not that good", she admits, “but its content is very important as it shows how the youth of the gated community are breaking the walls of their gated community and want to be part of the outside world". 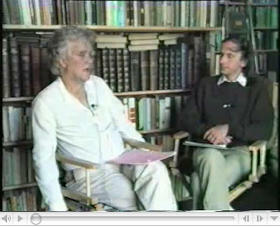 (via anthropologyworks) British-Canadian anthropologist Robert Paine died at the age of 84. Eveybody who’s interested in the Northern and Polar areas will know his name. He sent his most recent article for publication just weeks ago. Last year his second volume on the Saami Camps of the Tundra came out. It was nearly 40 years ago he went to Northern Scandinavia for the first time. The Far North was a non-prestigous area in anthropology at that time. The discipline was very different then, and there was little funding for research outside the purview of Britain’s Colonial Social Science Research Council. This did not deter him at all. He went off to study the Saami, then called Lapps, in Northern Scandinavia. “He had £50 in his pocket, and he went to the English seaport of Grimsby, to see if he could get a berth", said his partner Moyra Buchan. He worked odd jobs, eventually as a reindeer herder, learned to speak Saami, and immersed himself in that life for three years, even marrying a Saami woman, Inger-Anna Gunnare, with whom he had a son. “Robert was an anthropologist of the old school. A fieldworker. At his core, he was mistrustful of conclusions that weren’t ultimately based on the researcher’s own conversations with individuals in the field", wrote another famous arctic anthropologist, Jean Briggs, on Paines’ tributes page at Memorial University, Canada. It seems that there are no articles by him online, but his work is presented or referred to in several theses or papers that are freely available, for example in Living With Risk and Uncertainty: The Case of the Nomadic Pastoralists in the Aru Basin, Tibet by Marius Warg Næss, In the Reindeer Forest and on the Tundra. Modern Reindeer Management and the Meaning of Local Ecological Knowledge by Helena Ruotsala (published in Pro Ethnologia 18), Do Fences Make Good Neighbours? The Influence Of Territoriality In State-Sámi Relations by Scott M. Forrest and Claiming reindeer in Norway: towards a theory of the dynamics of propertyregime formation and change by Cassandra Bergstrøm.